A Farmer's saying: a cow shows its gratefulness towards the farmer by jumping. The higher it jumps, the more grateful it is. In different areas throughout the Netherlands there are cows going outside for first time in 2019. 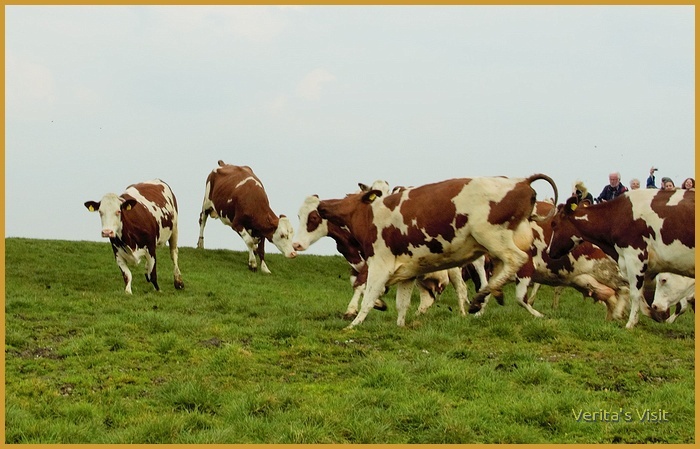 Mid-March a farmer in Flevoland was the first to let out his dairy cows in the green pastures. Living in The Hague and being a big fan of the dairy and cheese farms in Leiden area, I searched for a chance to see the cow dance in my neighbourhood. Cowdance, in Dutch called koeiendans is the frolic jumping, twirling and running of cows let out in the meadows for the first time in spring. I saw the cows going outside for the first time at different dairy & cheese farms in Hague/ Delft / Leiden area in previous years. Boerderij de Vierhuizen is one of my favourites. It’s an amazing farm with calfs, lambs and there’s a lovely atmosphere. I’ve had quite some conversations with the farmers on when it’s the right time to let the cows dance. Cows can’t dance when the soil is still soggy, cows can’t eat grass when grass hasn’t grown yet. If the farmer lets his cows out to early, they trip in the soggy soil and will need to get back into the barn again as there is no grass yet. It’s actually quite animal unfriendly to let them out too early. You will surely enjoy the cow dance more if you wait a bit. A little race going on between cows going outside first time in 2019. Sometimes it’s just great showing your excitement, even when all other cows have finished jumping around. Life gets back to normal. Here’s a poor lonesome cow a long long way from home. Land van Wijk en Wouden, in Leiden area gives you the opportunity to register for a ‘cow alert’. This way you receive the latest updates on when and on which dairy and cheese farms in the area between Leiden and Zoetermeer you can see the the cows going outside for first time in 2019. Vockestaert, in Delft area also has a cow alert. They publish the dates you can see the cow dance on their FB page. Do you want to know more about the cheese that is made out of the milk given by a cow that has eaten fresh grass again after a long time? If you want to find out, just get in touch.